So who better to have on hand when they arrive one morning to discover that the school’s books have all disappeared! Who could have taken them? And why? 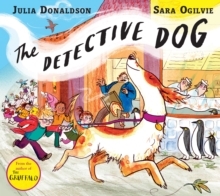 There’s only one dog for the job… and Detective Dog Nell is ready to sniff out the culprit!Written by the brilliant Julia Donaldson and stunningly illustrated by the multi-talented illustrator and printmaker Sara Ogilvie, The Detective Dog is a fast-paced celebration of books, reading, libraries, and the relationship between a little boy and his rather special dog.